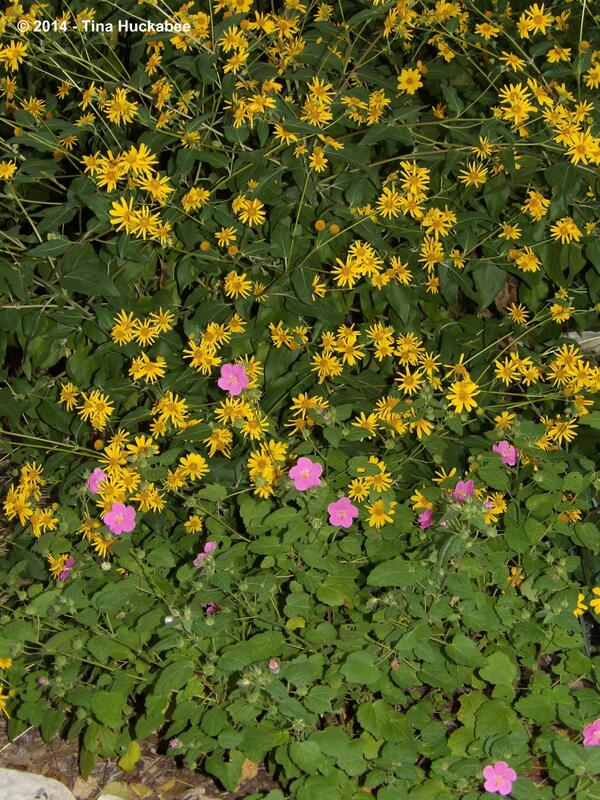 In keeping with my native plants manifesto which you can read about here, I’m celebrating Texas Native Plant Week by profiling some of the native plants in my own gardens. 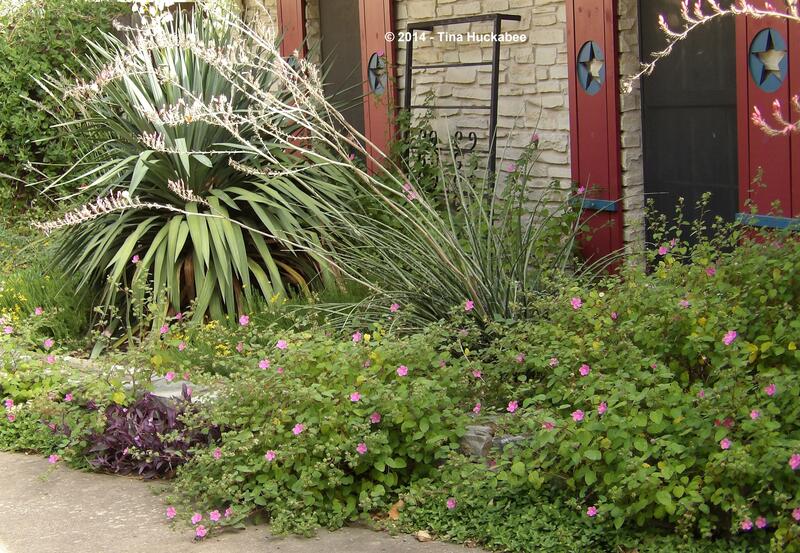 The information reflects what I’ve learned from the transformation of my traditional maintenance-heavy “yard” to a no-lawn, water-wise garden, featuring beautiful Texas native plants– which were the drivers and are the stars of that metamorphosis. 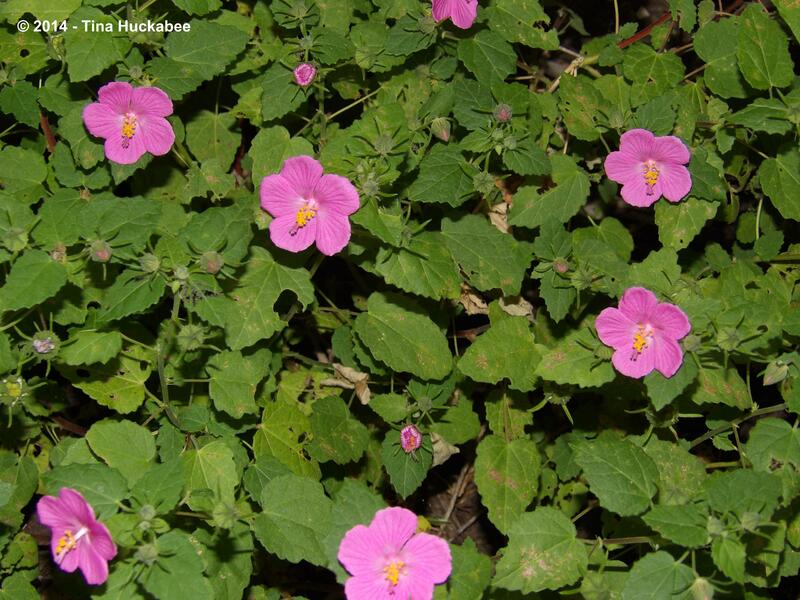 I grow lots of Rock Rose, Pavonia lasiopetala, in my gardens. to full sun, though it blossoms more in full sun. The pretty-in-pink flowers open early in the mornings and close for business by 3 or 4pm during the heat of summer. The closing of those blooms is the plant’s response to heat and is a natural conservation measure. As cooler autumn months arrive, the blossoms will stay open until sundown. 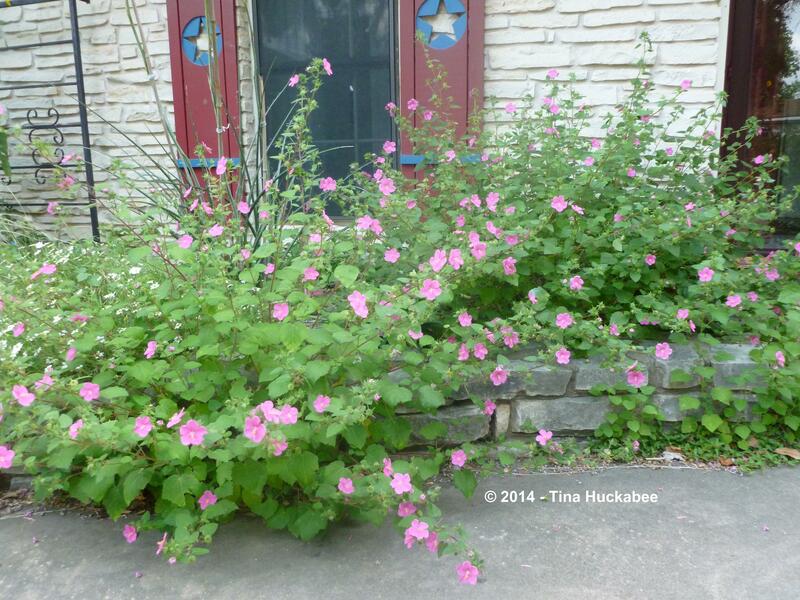 Rock Rose will seed out–really seed out, so if you don’t like that, it may not be the plant for you. I simply yank up the seedlings I don’t want and give them away, compost them, or transplant them. 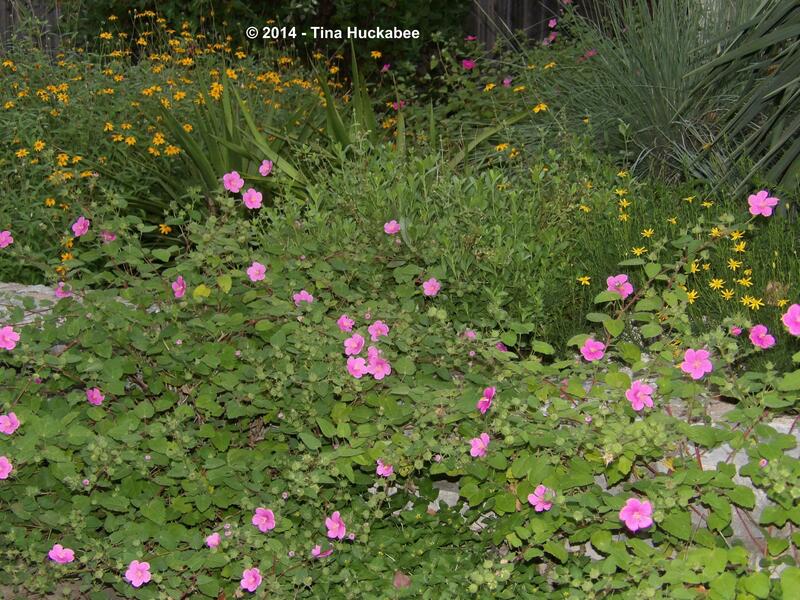 Rock Rose is one of those plants that I pop in difficult situations where I’m having problems figuring out what would work; it’s a staple plant in my gardens–good in so many situations. 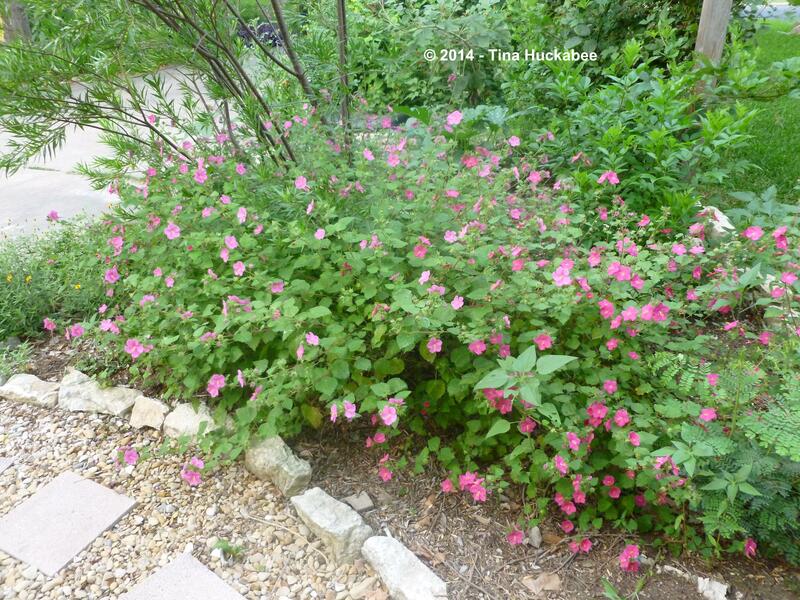 Rock Rose flowers on new wood, so after bloom cycles (which start in May) you can “deadhead” or prune the stems (6-8 inches) and the plant will flush out with new growth to start the next bloom cycle. 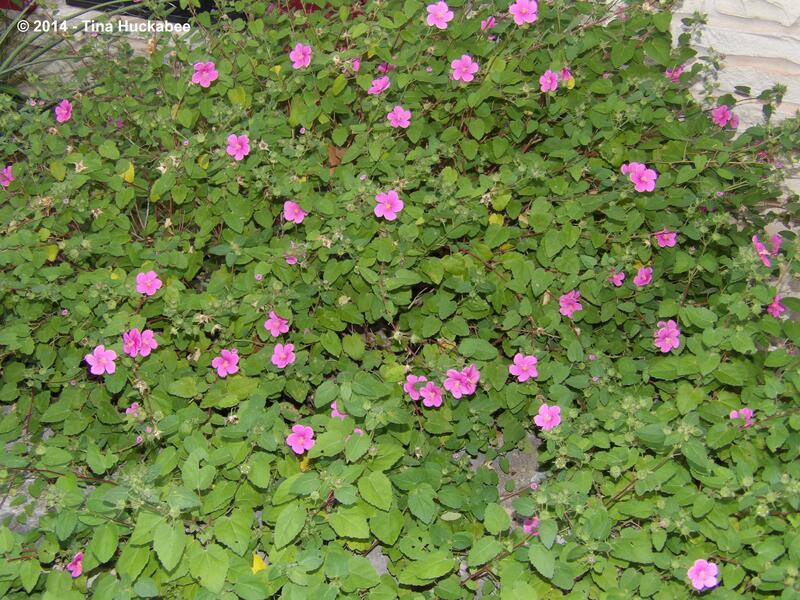 If you object to pruning, you can let Rock Rose continue to grow and it will bloom, but slightly less because it’s placing its energy toward seed production. 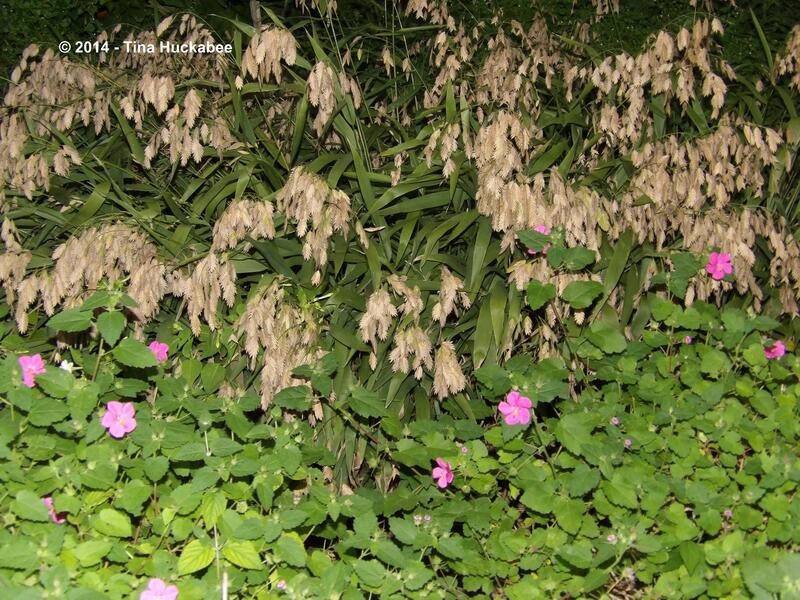 If left unpruned, the branches arch over, heavy with seeds and blooms. 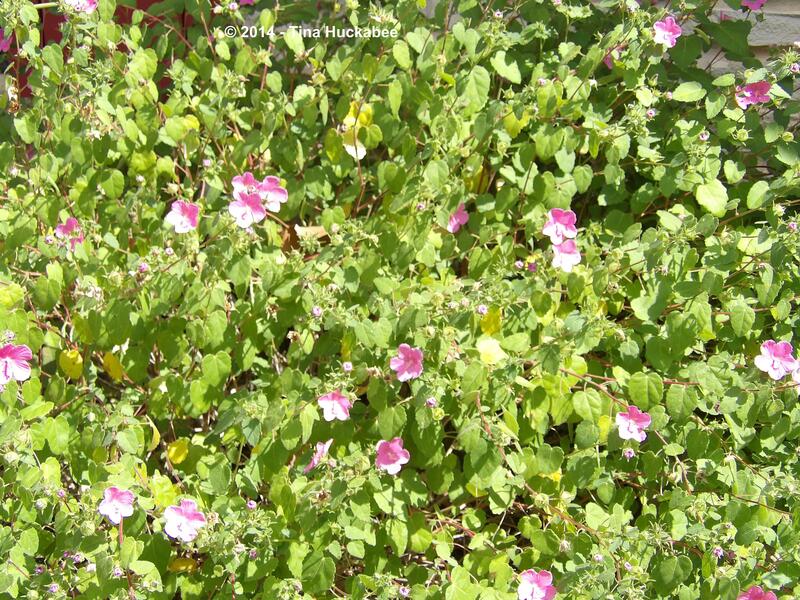 Rock Rose is evergreen, though not a lush evergreen–green leaves remain on the shrub during winter; the plant is more woody than green. 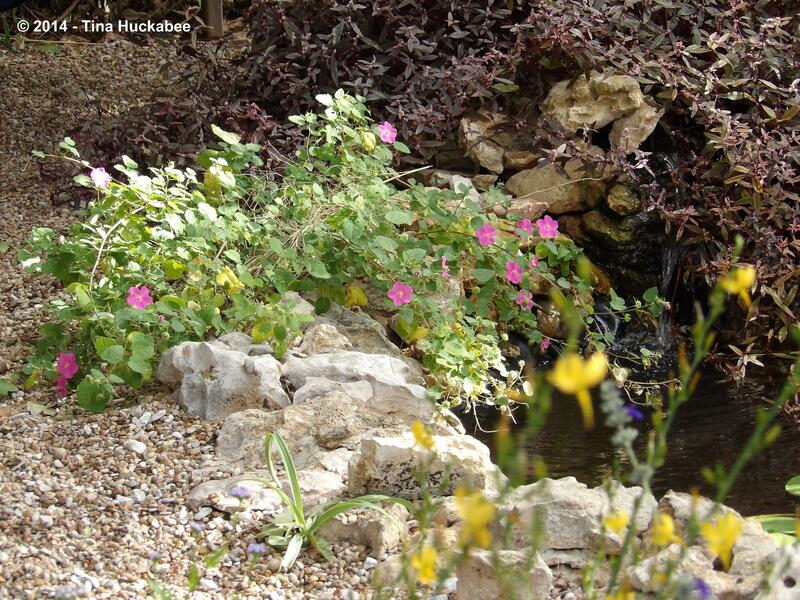 …but Rock Rose is loveliest in its casual form, meaning that this is a perennial you don’t want to shape too much–let Rock Rose, be Rock Rose. 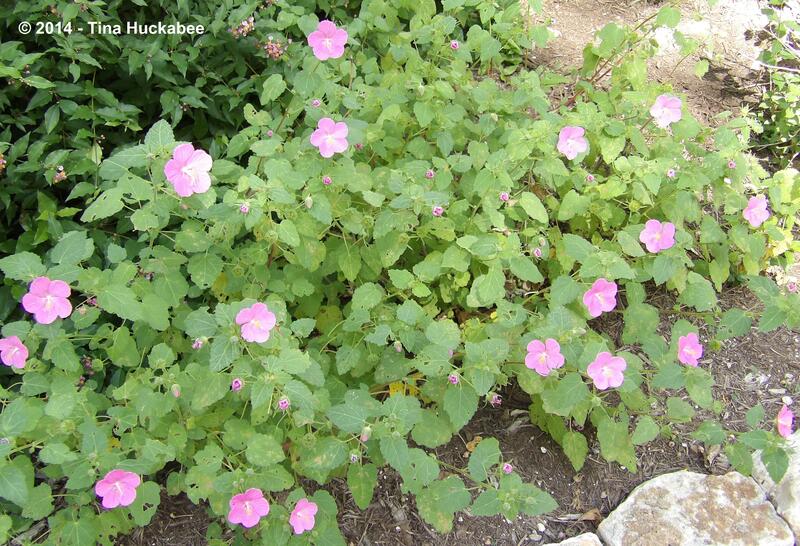 Rock Rose attracts bees, butterflies, and hummingbirds but isn’t a specific host plant to any particular critter. It is moderately deer resistant and very drought resistant. Native to Central to South Texas, I wouldn’t guarantee winter hardiness in the northern parts of Texas. It probably acts as an annual. Don’t worry if it croaks during the winter though, I’m sure it will seed out. 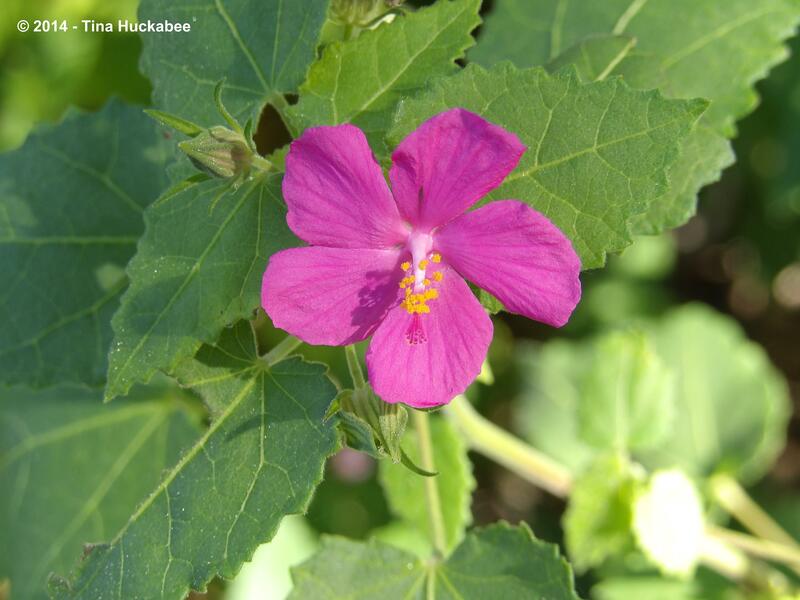 This entry was posted in Native Texas Plant Week, Pavonia lasiopetala, Rock Rose, Uncategorized and tagged Native Texas Plant Week, Pavonia lasiopetala, Rock Rose by Tina. Bookmark the permalink. If anybody was ever a holdout against trying out Rock Rose, that last photo would change everything. What an especially gorgeous shot! I truly appreciate the year round information you shared. It is often hard to imagine where to try out a new plant without knowing how it will behave from season to season, and I especially am grateful for the pruning information. Knowing how much and when to trim is half the battle with blooming perennials. I can’t wait to see what plant will get the full Tina Treatment next! Lucky photo shot–everything conspired to make it right! I should have mentioned that I do prune pavonia three times/year: winter (the hard prune, to about 10 inches from the ground; late spring/early summer (depending upon rainfall)–about 1/3; late summer (July-August). Except for the winter pruning, I can cut back pavonia very casually with the other prunings–as I have time. I will say that I prefer to prune in late afternoon, once the blooms have closed. It’s hard to snip off those pretty pink things. The last close up is perfect. I have tried many times to photograph this plant but it is tough to capture the colour like you did. I really appreciate any and all horticultural tips. I have rock rose growing here and really like it. I have a few that just appeared one year in a dappled spot under the oak. I was so grateful just to see anything growing and surviving there that I mostly just left them be. But one bit kept flopping onto a path. When I trimmed it I worried that I was probably going to set it back for years to come. Nope. What a difference! That trimming transformed it from lank to healthy and thick. I wish I had known sooner that it was ok to cut it back. I have trouble photographing the flowers too. They often come out a paler pink than they really are, especially, in distance shots. The close-ups are truer, I think, to the color. Pavonia like to be trimmed. Much like many of the salvia species here, pruning is a good thing–it keeps the plant in a bloom cycle and keeps it tidy. I plan to have a “seasonal look” post with pavonia…sometime. I really love pavonia–such a good plant for our gardens! I’m glad you’ve had success with them. There’s more where those came from…. Question about pruning pavonias. I have two kinds: the lasiopetala, which I normally cut back hard to about 12″ in February and have zero issues with. Then there is the brasiliensis which is FABULOUS but has grown so ENORMOUS even with the same hard February pruning, that it threatens to lift me out of my own living room, couch and all, and deliver me to the post office for mailing (well, maybe a slight exaggeration…). Every spring it sits there looking sad and mistreated and I think I’ve killed it for sure this time. But by May it’s greening up and blooming its head off. Then it keeps growing. Right now (Oct 22) it measures 4′ tall and 6′ around. I can’t complain. It is glorious, covered with blooms. But at this rate, I’m almost scared of how big it will get. Any suggestions? I’m assuming it’s okay to prune throughout the season, tho’ I have never done that. Also, while I’m at it: both my pavonias are in the backyard, safe from deer. Dare I plant/move them to the front, where the voracious little buggers can have at them? I hesitate to give advice about a plant I haven’t grown, but a quick check of the P. brasiliensis makes me think that you could treat it like most mallows: hard prune in late winter, tidying up in May/June and then again in July/August and maybe even one more in late September. 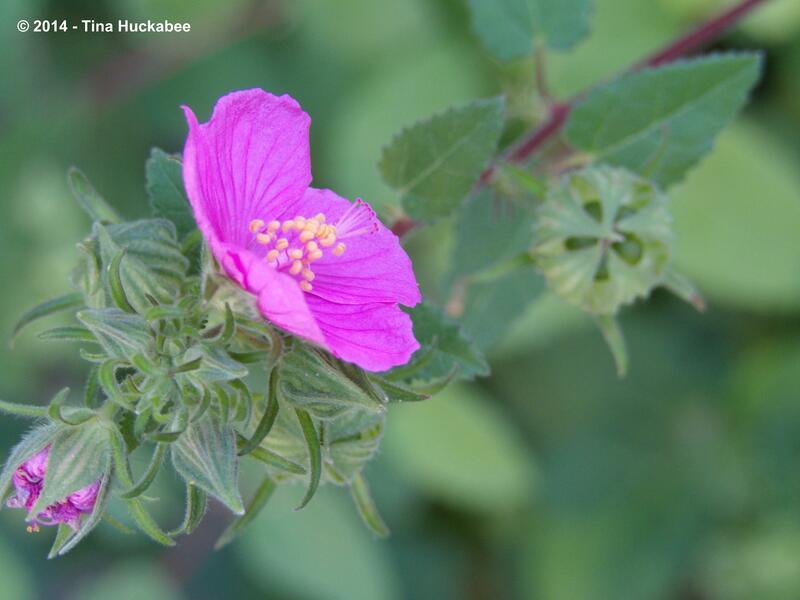 Most mallow plants bloom on new wood, so pruning several times a year, 1) keeps them tidy, and 2) allows for new blooming. I don’t know where you live, but most mallows are hardy in the southern most part of the U.S. and even northward. I sounds gorgeous, but you’re right–some plants look like they’ll take over if you let them. I think the deer resistance is “moderate” so, gardener beware! Good luck! Wow! That was super sonic fast! Thank you so much for your reply, it helped so much, & I will follow your advice which I’m sure is correct. What about deer resistance? I’m guessing “moderate” at best against the munching beasties, but there’s no way to know except to try them out!